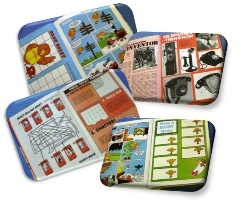 The Buzby annual contained Buzby cartoon stories, puzzles, articles on the history of the telephone and ideas for things to make; in this issue you can create a Buzby movie by making a simple flick book. This annual is from 1979 and was published by Brown Watson and printed in Holland. It is marked copyright Post Office telecommunications 1976, 1979. A slightly rarer copy of the Buzby annual, this time from 1980. 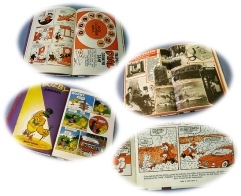 The annual contained the usual mix of Buzby cartoon stories, articles, puzzles and things to make; in this issue you could make a telephone dial tiddlywinks game. This annual was published by Brown Watson, London and printed in the Netherlands. It is marked as copyright Post Office Telecommunications 1979 and 1980. 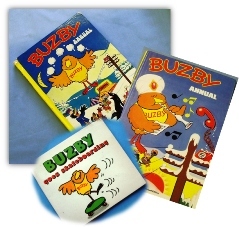 There was a series of paperback children’s books featuring Buzby stories published by Severn House Paperbacks Limited. They were written by Hilary Alcock and illustrated by Mary Roberts. Featured here is Buzby goes skateboarding. The book was published in 1978 and measures 140mm x 125mm. It contains 16 pages and retailed at 40p. Sorry, but I couldn't spoil it for you by revealing the ending. You'll have to buy your own copy to see who won!